New glimpses of HBO's upcoming Game of Thrones surfaced this past week, including a another brief production video, as well as a look at some proprs. This video features production designer Gemma Jackson, talking about her role in designing the entire look of the show, "from the floor to the sky". Exciting stuff! 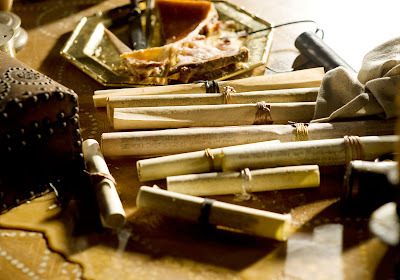 As for props, the first image is a pile of scrolls on a desktop; fans have deciphered the words "AEGON TARGARYEN, the fourth of his name, KING OF THE ANDALS and of the FIRST MEN" written on one of the scrolls. 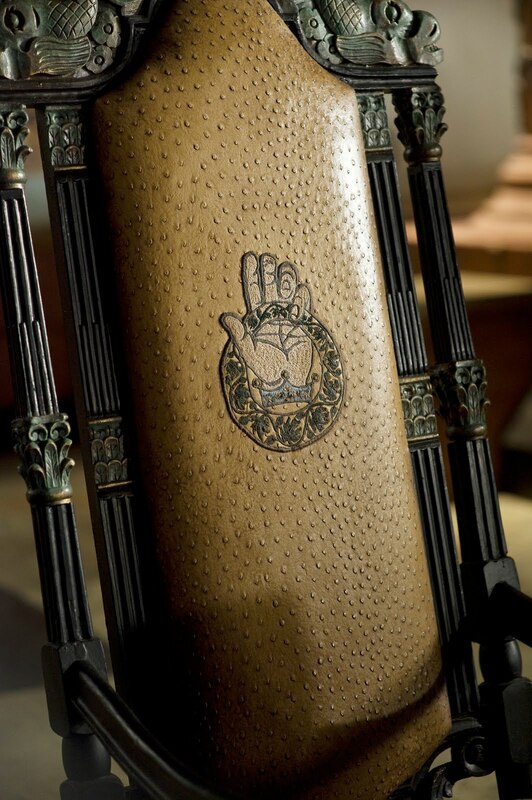 The second image shows the council chair where the Hand of the King sits. This chair was seen briefly in the most recent teaser trailer for the show. In the words of the producers, "Maybe not as intimidating as the Iron Throne...but every bit as dangerous."